If you’re travelling to Phuket it’s good to know what you’re in for, weather-wise, before you pack your bags and make your plans. But one thing’s certain: you’ll be comfiest in beachwear and flip-flops no matter what time of year you arrive. Rain or shine, Phuket is hot! Though temperatures vary little from month to month, there are three distinct seasons within the tropical monsoon climate of Phuket: dry, hot and rainy. Sunny skies, footprints in the sand. Nai Thon beach in December. In November, the monsoon winds shift and begin to flow in from the northeast, bringing cooler (though far from cool) temperatures that continue through February. 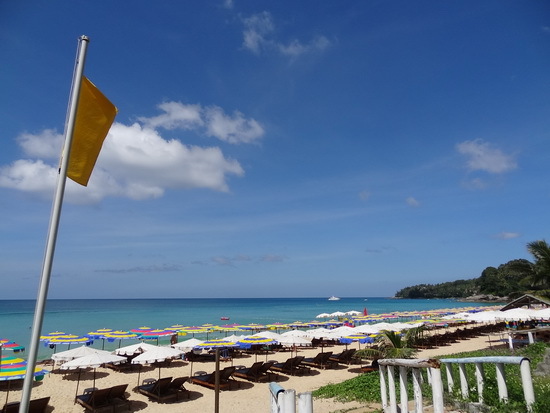 It’s also the driest, sunniest time of year and Phuket’s peak season for visitors. Expect to find calmer seas, blue skies, and more crowded beaches during these months. Accommodation prices will also be at their peak, especially from mid-December to mid-January. Swimming’s a go, but you’ll have some company! Surin beach in high season. March, April and May are Phuket’s hottest months and the days can get uncomfortably hot and sticky. Coinciding with the Thai school holidays, this is when many locals get out of town or flock to the shopping centres to escape the blazing weather. If visiting Phuket during these months, it’s well worth shelling out more for an air-conditioned hotel room or a resort with a pool. Rain showers come and go and generally don’t hang around for too long. From June through August, relief from the heat comes with the southwest monsoon winds, which bring more cooling rains. The rainfall during these months usually comes in short bursts, so there are still plenty of sunny days to enjoy. With fewer people around and sometimes significant discounts on offer at many Phuket hotels and guesthouses, July and August can be great months to visit, especially for those on a budget. Photographers love to be here during these months, too, since the island is greener and fresher, the light more varied and interesting, and the skies livelier – Phang Nga Bay looks especially misty and mystical then. Wet but warm. 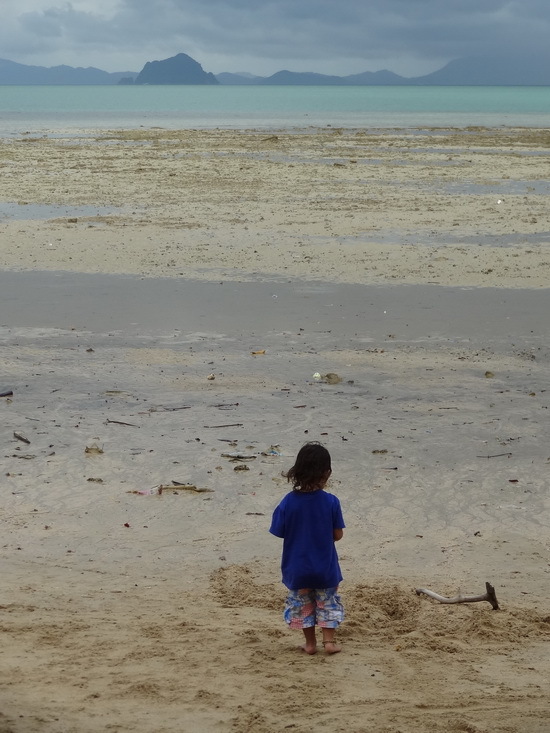 A child plays on the beach between rain showers on Ko Siray. For September and October, be sure to bring your umbrella since these are Phuket’s wettest months. It really buckets down at times, sometimes turning roads into rivers. Getting around can get damp and dicey, especially by motorbike. If you’re visiting Phuket during these months, bring some books or a well-apped iPad and plan for some days inside. If you find yourself in Phuket during a spell of heavy rain, it might be a good time to take that Thai cooking course, visit indoor sights like the Phuket Aquarium or book a massage session. If travelling with children, try seeking out a resort with a kids’ club to keep the wee ones busy if it’s too stormy for the beach. Or if you’re keen to avoid rain at all costs, you might want to check out the weather in Samui and the Gulf Coast islands before booking your flight to Thailand, where the dry and wet seasons fall on different months. In the past, many Phuket hotels, restaurants and shops shuttered their doors during the rainy months, but this is no longer the case: Phuket has emerged as a year-round destination. That said, it’s certainly not safe to swim year-round. Through the so-called green season, strong waves and hidden riptides can quickly turn a day at the beach into tragedy. 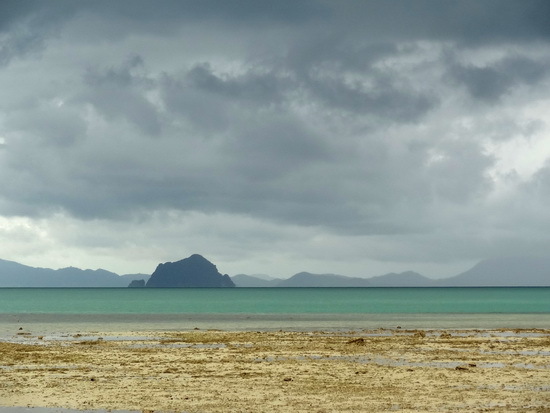 Stormy but still scenic, Ko Siray. At the larger west-coast beaches, you’ll likely see red flags pitched in the sand on some days. 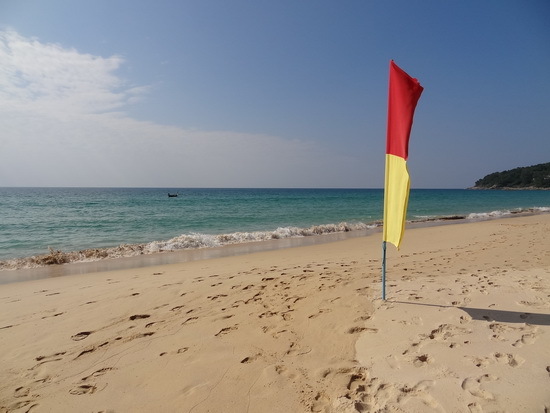 For those unaware of this beach safety warning, the red flags mean ‘No Swimming!’ Even in deceptively calm seas, dangerous undertow may be lurking beneath the surface. Be sure to heed the warnings. September and October is Phuket’s surfing season, as these are the best months to catch some waves, especially at Kata and Kata Noi beaches. Temperatures: Daily averages fall within the 25-30 degree Celsius range all year with humidity levels at 80 or higher for most of the year. Average high temperatures range from 30-31C in September through December, peaking at 33-34C in March-April. Average lows are in the mid-20s throughout the year. Rainfall: The driest months are January through March, with 30-40 millimetres of rain on average. The months of May through October have average rainfall of 200mm, peaking in September at 400mm.